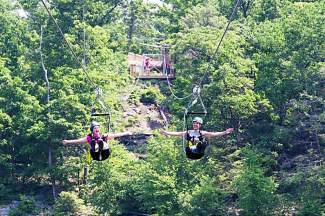 Breckenridge's expansion plan includes two mile long ziplines like the ones pictured, in addition to canopy tours, ropes courses and other summer activities. Officials from the White River National Forest and Breckenridge Ski Resort hosted a public information session Wednesday to introduce the resort’s plan for summer expansion to a crowd of about 50 locals. Representatives from both groups presented a map of the proposal along with images of similar summer facilities at other resorts. Breckenridge’s plan includes zip lines, ropes courses and canopy tours, as well as expanded mountain bike trail network and jeep tours. Additionally, the plan calls for construction of an outdoor climbing wall — at mid-mountain on Peak 8 — and summer operation of two high-alpine chairlifts — Chair 6 and Imperial. Officials said all of the proposed facilities fall under the resort’s Forest Service special-use permit and the guidelines of the 2011 Ski Area Recreational Enhancement Act — co-authored by Colo. Sen. Mark Udall and designed to allow resorts to expand summer offerings on public land. The act is in part an attempt to help ski-town economies during the off-season, and was intended to allow ski areas to use “existing infrastructure,” like chairlifts and gondolas, in order to expand summer activities. “I think Congress very much wanted us to do this,” White River National Forest supervisor Scott Fitzwilliams said as he introduced the Breckenridge project. Whether the plans falls under the guidelines of the enhancement act was a source of some contention among those opposed to the expansion. Chief among public concerns were the broad scope of the project, the potential additional construction required, the preservation of high-alpine — above-tree-line — terrain and a proposed canopy tour in the heavily forested Ore Bucket area on Peak 8. For Breckenridge resident John Rossman, the extent of the expansion seemed unnecessary. “I’ve seen a lot of unsustainable growth in the last decade,” he said of Summit County, calling the resort’s plan “more of an amusement park,” which is explicitly prohibited under the guidelines of the enhancement act. Jeff Carlson, who sits on the Breckenridge Open Space Advisory Commission, agreed that the proposal was somewhat excessive, but acknowledged that portions of the plan closer to the base area could be positive. “A lot of it seems a little too much,” he said looking at the map, adding that some of it “could work.” His primary concern was the canopy tour of the Ore Bucket area, currently a popular tree-skiing run. He worried that the structures involved in building the zip-line canopy tour would affect ski runs, involve tree cutting and bring summertime traffic to an area that was closer to wilderness than other parts of the mountain. Jeff Zimmerman, director of mountain planning for Vail Resorts in Summit County, pointed out that the proposed towers for the activities were intentionally placed in areas with minimal tree coverage. He also said that the terrain in question would still be ski accessible. “Our goal is to minimize cutting trees,” he said, adding that the project is intended to get people who may not ordinarily explore wilderness a chance to get into nature in a safe environment supported by staff and medical services. Breckenridge officials also said they believe the project has the potential to help the local economy and expand summer tourism, just as the enhancement act intended. She explained that the facilities would have the potential to attract more summer guests who would in turn support local businesses and lodging in town and potentially stay for other area activities. While Carlson agreed, he also expressed concern that the project would not generate any tax revenue for Breckenridge. The proposed expansion remains in the initial stages of the National Environmental Policy Act process. The Forest Service will accept public comments on the first stage of the proposal until March 12. The plan will then be assessed through an initial environmental impact study conducted by the Forest Service and the SE Group — an independent consulting firm contracted by the Forest Service. Forest Service officials anticipate that the first draft of the environmental impact statement will be released some time this fall for public review. After a second comment period and public session, the proposal will undergo final review. Pending approval Breckenridge could begin construction in 2015.